The strong center of community starts here. Founded in 1866, Statesboro, Georgia, has long been on the map for regional growth. Our busy and historic downtown has been central to city, county and regional development enabling expansion in government, business, agriculture, education and residential living. As Statesboro grew and expanded, the community recognized the importance of preserving and strengthening the downtown district as the heart of our hometown. The Downtown Statesboro Development Authority was created in 1981. On April 15, 1991, Statesboro was declared a Main Street City, by the National Trust for Historic Preservation, a movement built on the knowledge that a prosperous, sustainable community is only as healthy as its core. The Main Street Program and Downtown Statesboro Development Authority work as two organizations in one. We are committed to the economic development, historic preservation, and beautification of Statesboro’s downtown area. Downtown is the historic center of a community, representing the city itself in many people’s minds, as it remains the center for government and finance. Downtown’s built in environment is unique, representing a living history that bears testimony to the economic forces that created the city. Strip centers and malls are very similar. Downtown is a community’s signature. It leaves a mark on the mind. Downtown represents a tremendous investment over many years by both public and private sectors, yet properties are allowed to deteriorate decreasing tax bases. 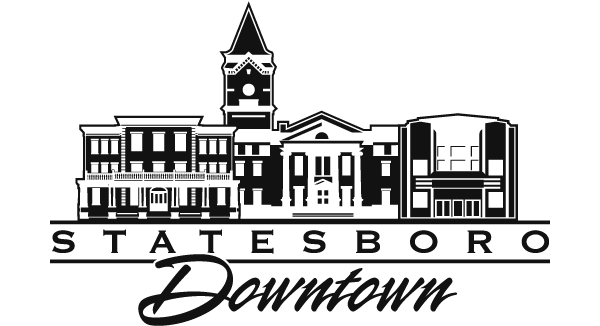 Downtown is a major industry as Statesboro’s Main Street District has over 200 businesses that employ over 1,700 people. Looking at these numbers, the economic impact of downtown is apparent. We must realize the importance of working with existing industry to ensure its viability. Downtown is a tangible symbol of the quality of life. A prosperous downtown, thriving with activity and business sends a positive message to industrial prospects and individuals searching for a home. The reflection on the investment climate of a city may be the single greatest consideration in downtown development and it needs to give the impression that it is a good place to leave investment dollars. The DSDA Board is made up of members of our community who their expertise, experience and commitment to serving and strengthening Downtown Statesboro. Feel free to contact them with your questions or comments. The Board is led by Executive Director Allen Muldrew and can be reached at mainstreet@statesborodowntown.com. To view this month’s meeting agenda, please click here. Design – Enhancing the physical appearance of the commercial district by rehabilitating historic buildings, encouraging supportive new construction, developing sensitive design management systems, and long-term planning. Organization – Building consensus and cooperation among the many groups and individuals who have a role in the revitalization process. Promotion – Marketing the traditional commercial district’s assets to customers, potential investors, new businesses, local citizens and visitors. Economic Restructuring – Strengthening the district’s existing economic base while finding ways to expand it to meet new opportunities and challenges from outlying developments. Imagine a two-acre green space community park in the heart of downtown. Pavilions for concerts, art festivals and other events. A water feature splashing at its center – where children play and adults relax. A place for group outings and family fun. A beautiful destination day and night, year round. That’s the vision for a new Community Park, an innovative collaboration of the DSDA, the City of Statesboro, Bulloch County, business and private entities. While still in the early development stage, it offers the promise of a landmark venue for Statesboro residents and a draw to a multi-county audience. In 2011, a master plan was developed offering a bold vision for downtown Statesboro’s future— a vision based on the ideas, values and dreams of a diverse community. It is a vision rooted in an appreciation of downtown’s legacy within the history of our city and region. It seeks to ensure a vibrant and healthy downtown that continues to enrich Statesboro’s economic, social and cultural foundations for generations to come. The master plan lays out both a short-term plan providing direction for immediate private and public investment opportunities, as well as a long-term plan providing guidance for actions and decisions that will shape downtown and Statesboro for the next 20 years.